Today's card was created using a SSS stencil for the background and 2 different Altenew stamp and die sets. I started by creating my background using the Diagonal stripe stencil from Simon Says Stamp and 2 different distress inks. I taped the stencil to my work surface and applied one colour first then turned the stencil once and created the other colour of stripes going in the opposite direction. Die cut the whole panel with a wonky rectangle die. Stamped and die cut the leafs with different green inks. Stamped and die cut the flower and coloured with Copics. I then added some little white dots to the flower with a gel pen. The sentiment was stamped and die cut. 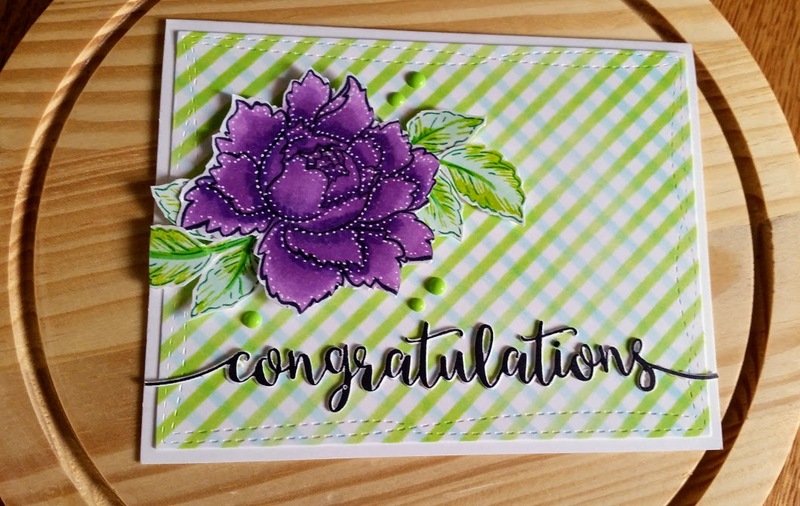 Added some green accents with Nuvo crystal drops to my card and Wink of Stella to the flower.